At an event for his charity, Ben's Fund, Schneider said he was assured Earl Thomas wouldn't hold out. It was also the first time he was asked about the Colin Kaepernick situation. 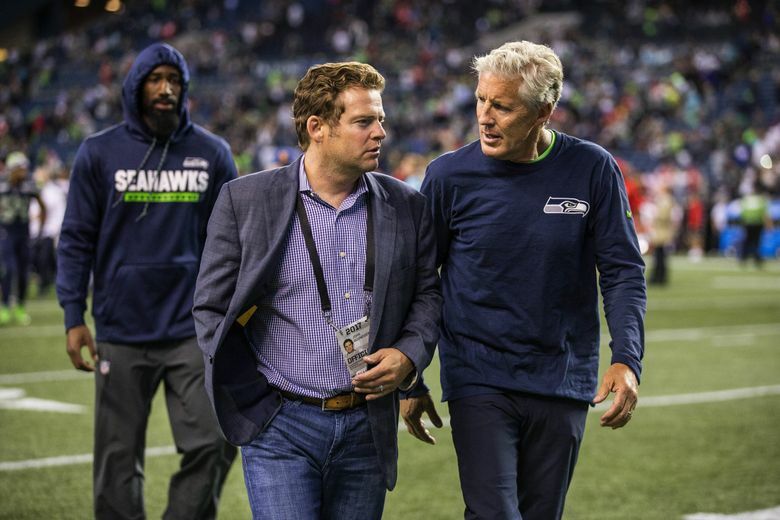 Seahawks general manager John Schneider didn’t exactly guarantee Earl Thomas will still be a member of the team when the regular season begins in September. But during an interview Thursday night prior to a dinner to raise money for his charity, Ben’s Fund, Schneider said he has been assured that Thomas will not hold out next season even if he doesn’t have a new contract. And if the team is confident Thomas will not hold out then it may have less reason to pursue a trade for the eight-year veteran free safety. The fate of Thomas remains he biggest question hovering over the Seahawks with the NFL draft nearing next week, with rumors that Seattle could consider trading him, and specifically to Dallas, if it thinks a new contract cannot be worked out. Thomas is entering the final year of a four-year, $40 million deal and hinted in an interview with ESPN in January he might hold out if he does not have a new deal. Schneider was a little more vague on if Thomas will indeed remain with the team in 2018. Schneider reiterated that he has not talked with Thomas’ representatives about a contract since the NFL Combine in late February/early March and that “they know where we are at’’ in terms of Seattle’s offer. Many players attended to serve as celebrity waiters including quarterback Russell Wilson. Another who attended was safety Bradley McDougald, who said that his plan is to play at strong safety alongside Thomas at free safety. McDougald, though, said he anticipated playing alongside Thomas in the secondary next season. Seahawks GM John Schneider and wife Traci talk about Ben’s Fund. — No comment on if Seahawks asked Kaepernick about kneeling: The interview was the first time Schneider has talked to the media since a report that the Seahawks postponed a visit by free agent quarterback Colin Kaepernick when he wouldn’t say whether he would continue to kneel for the national anthem. Asked pointblank if Seattle asked Kaepernick about kneeling, Schneider said he couldn’t comment on what the team asks free agents during the interview process. — Nothing definitive yet on McDowell: Asked about a report that surfaced this week that the team is close to waiving second-year defensive lineman Malik McDowell since he will not be able to pass a physical due to head injuries suffered last July in an ATV accident, Schneider said nothing had yet been decided. — Chancellor, Avril still in a holding pattern: While rumblings persist that the careers for safety Kam Chancellor and defensive end Cliff Avril may be over due to neck/stinger issues suffered last season, Schneider said things remain in limbo. — Schneider says doing due diligence to attend Allen’s Pro Day: While his visit to scout the Pro Day for Wyoming quarterback Josh Allen — projected as a high first-round pick — made news when it was revealed Wilson’s camp called and wanted to know if it meant anything for his future, Schneider said he was just doing his job. Schneider, who had several stints in the Green Bay organization before taking over as GM of the Seahawks in 2010, noted that the Packers were known for stocking up on quarterbacks even when they had an established starter, and also said he attended Allen’s Pro Day because he wasn’t able to see Allen in person during the season. “It’s not out of the ordinary,’’ Schneider said. “The two most important people in the building are the head coach and the quarterback. And I was raised, I was really blessed to start with Ron Wolf and he was the general manager in Green Bay for 10, 11 years and he traded for Brett Favre right when we got there and he acquired Matt Hasselbeck, Mark Brunell, Ty Detmer, Aaron Brooks. But I don’t feel like we have done, me personally have done a good enough job of continuing to acquire quarterbacks all the way through. “It’s a little more difficult now because we don’t have NFL Europe (which dissolved in 2007) so we can’t be placing these guys like Kurt Warner, Brad Johnson, a whole bunch of guys being able to go play and developing guys. We need to do a better job of developing quarterbacks, period. So the reason I went is because I was supposed to see him play live in San Jose and he was injured, we were playing San Francisco the next day (last Nov. 26) and he didn’t play so I had to go see him. That’s it.